Born to a yeoman farmer and estate steward in a small village in Northumberland, Lancelot ‘Capability’ Brown (1716–1783) remains one of the most influential figures in British garden history. 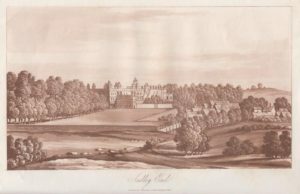 Brown’s vision was to have a dramatic effect, not only on the particular estates he shaped, but upon the perception and reception of British topography in general. His work can be seen in some of the finest country estates and his principles of comfort and elegance were to influence landscapes as diverse as suburban gardens and municipal public parks. The peak of Brown’s career came in the latter half of the eighteenth century. Wealthy landowners recently returned from the Grand Tour of Europe sought to replicate the classical landscapes they had seen idealised in paint. Although only a tiny minority had both the estate and the money necessary to realise his schemes, improvements to road infrastructure meant that a growing number of middle-class travellers could inspect Brown’s work in the capacity of ‘polite tourists’. By the end of the century, the expanding publishing industry was serving the largest audience of Brown’s landscapes – the armchair traveller. These consumers could ‘tour’ the grandest schemes, inspect Brown’s improvements, and evaluate their success, without ever leaving their parlour. While verbal accounts were helpful, most popular by far were illustrated volumes. A legion of artists served this market, travelling and recording Brown’s landscapes in pencil, oil, watercolour and ink. The result is a rich record of Brown’s landscapes as they were viewed by his contemporaries and by successive generations.